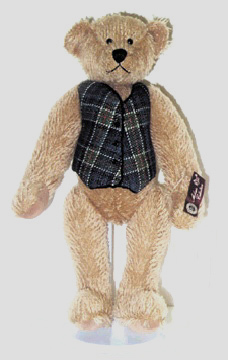 100% Mohair-covered handcrafted 12" tall bear with hand-painted Thistles on a needlepoint medallion (1.25"w x 2.5"h) on the back of a 11.7"w x 5.5"h 18-mesh mono canvas vest. 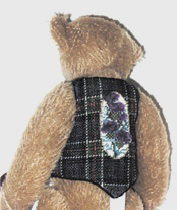 A custom chart for the pattern of the vest with your choice of Scottish tartan are included. Threads (for the tartan pattern), optional stand, and optional thread pack (for the medallion) will be billed separately. Price below is for the bear and canvas only. If you do not wish threads for your canvas, please select "None" from the "Threads" option.